Ascari also must rank high, he also was (almost) unbeatable during his two championships with the Scuderia. I wonder could they be going to a team with a Spanish driver? I thought Phillip Morris was the primary sponsor,they pump in more money than Santanders did.?. I don't believe that as a tobacco company, Philip Morris, are permitted to be known as sponsors, and therefore their involvement is as an "investor". On Ferrari's official website, they are listed under their Partners Section, as a 'Sponsor' at the top of the list. They don't appear on the home page though under the list of sponsors though. Alfa Romeo are second, with Santander being third - so it would be wrong to refer to Santander as a title sponsor. I noticed a four leaf clover logo on Vettel's overalls but there is only a small Alfa logo almost hidden on the engine cover of Ferrari. Santander is one of the most prominent names on the car. I agree that Santander appears to be the most prominent. It just seems strange the order of precedence given on their website, in placing them third. I would imagine Philip Morris is the closest to a 'title' backer they have. I have long wondered what Philip Morris gains from this partnership. As long as the Ferrari cars and team feature on TV programmes within the EU, no promotional material can be used, so how does Philip Morris benefit? And how does Ferrari get away with claiming that Philip Morris are a sponsor, when the EU forbids it? And has been battling with Ferrari over the issue since at least 2007 ! I think the Philip Morris benefit is that they can use 'Ferrari' in their own promotional material elsewhere. In a similar way to the image below. With regards to sponsorship - I am not aware that there is specifically an EU restriction on a tobacco company providing sponsorship? There are restrictions on the advertising of products, which resulted in the significant decline of tobacco funding in F1. In many parts of the world though, it was never totally forbidden - so Ferrari opted to no longer run under the banner of Marlboro from 2011 purely for public sensitivity. 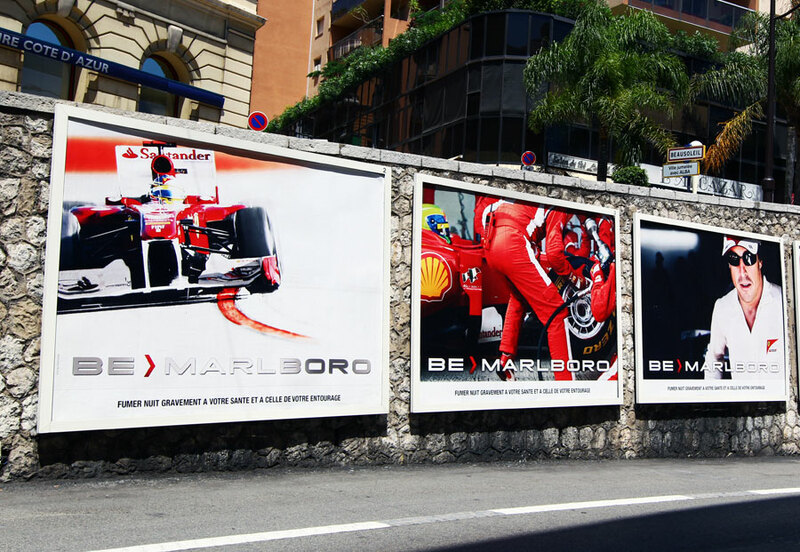 I am assuming that those advertising posters were in Monaco; they wouldn't be allowed in France. Yes - Monaco posters. An example of the kind of activity Philip Morris pursue outside of the EU. I think there are a couple of different views on what constitutes sponsorship. In the EC directive they also provide an extra clarification on what they define as sponsorship 'The ban covers advertising and sponsorship with the aim or [sic] direct or indirect effect of promoting a tobacco product'. I would imagine the lawyers in the red corner, if challenged, would assert that their interpretation of what is defined as sponsoring is a provision of funds, with no tobacco promotion associated. On Ferrari's website it gives a factual account of Philip Morris, rather than showing their brand(s). The EC directive, whilst using the word 'sponsorship' has the intention of reducing advertising, not funding. The letter vs spirit of the law debate here possibly? What should be included in a comprehensive ban on TAPS (Tobacco advertising, promotion and sponsorship) ? The WHO FCTC (Article 1) provides a very broad definition of TAPS. Tobacco advertising and promotion means “any form of commercial communication, recommendation or action with the aim, effect or likely effect of promoting a tobacco product or tobacco use either directly or indirectly”. Tobacco sponsorship means “any form of contribution to any event, activity or individual with the aim, effect or likely effect of promoting a tobacco product or tobacco use either directly or indirectly”. Therefore, it is important that enforceable measures be put into place to ban not only the traditional forms of direct advertising through media such as television, radio, print publications and billboards. There is also a need to ensure that indirect forms of TAPS, such as brand stretching, point of sale display of product and tobacco industry-sponsored CSR (corporate social responsibility) programmes, are also addressed. The WHO FCTC's Article 13 guidelines include an Annex with an indicative (non-exhaustive) list of forms of tobacco advertising, promotion and sponsorship within the terms of the WHO FCTC. I cannot easily find how this impacts on EU directives, nor can I ascertain whether Monaco has signed up to TAPS. Unfortunately, I cannot now find the part where this WHO directive includes sport teams and individuals, but it does exist. If I come across it again, I will post it. Last edited by Mike Harte; 27 Nov 2017 at 14:43.